The art of African beadwork amongst the Xhosa speaking people of the Eastern Cape, South Africa, had almost completely died by the late 1960’s, which makes the limited number of pieces available particularly valuable. Today there are but a few elderly women who still have these skills, and virtually none who practice them, as they often experience problems with their eye-sight when doing such fine work. The few younger people who still do beadwork are making contemporary beadwork, which differs substantially in style and function, from the beadwork made until the late 1960’s. Traditionally beadwork was made as a token of love from a woman to her man, while what remains of modern beadwork is made for commercial purposes. People were also traditionally buried with their prize possessions, which usually included their beadwork. The consequence of this practice, is that very little remains of earlier African Beadwork. Modern Xhosa men, as a rule, no longer wear beadwork as a consequence of the influence of westernization. The rare and valuable collars shown in our gallery (as an example) would have taken between two and three weeks, of full-time labour to complete. This is particularly the case with items which are made using animal sinew, which in itself takes a long time to prepare. In almost all instances sinew which is 50 or 60 years old is stronger than cotton, which is significantly newer. Many of the trade beads used are of colours which have not been produced since the Second World War. Modern Xhosa beadwork is done primarily using larger beads (size 8/0). The majority of items in our gallery were produced between 1930 and the late 1960's. During this time, a large variety of sizes were used by the Thembu people, from tiny size 11/0 to the larger size 6/0 beads. 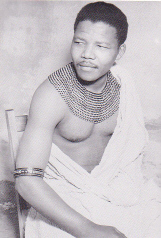 Nelson Mandela, first president of the "new" South Africa is a member of the Thembu Royal Family, which is split into the Emigrant Thembu (Western part of the former Transkei Interior; Queenstown to Engcobo) and the Thembu Proper (the more senior of the two groups to which Nelson Mandela belongs; from Engcobo to Umtata). For important rites of the Thembu tradition, members of both royal houses are required to be present. This photograph taken of Mr. Nelson Mandela in beadwork, was released by the African National Congress in the 1960's, but was not published in South Africa before 1990, once the ANC was unbanned and Mr. Mandela released. Amongst the Zulu people, very few traditional pieces (such as those displayed in our gallery) are produced. For the most part, the art of beading has been lost to the younger generation and is seldom practiced, even in particularly isolated areas. Virtually the only beadwork available at the moment (other than a relatively few old pieces being collected by our runners), is being produced by the Shembe, who are an independent African church that encourage the use of African beadwork during their religious ceremonies. As a result of the fact that the only beadwork available, is produced by the Shembe, their beadwork is often used by secular Zulu people who are not members of the Shembe faith. The beadwork produced by the Shembe, makes use of traditional techniques, but non-traditional objects such as wrist bands are produced and different colours are used from the traditional colours. This is mainly as a result of the fact that the old beads are virtually unobtainable. One item of beadwork that seems to be staging somewhat of a revival among Zulu girls, is the virginity apron. This is a fringe style apron made from brightly coloured beads, that hangs down and covers the pubic area. One possible reason for it's recent popularity, could be the fact that AIDS is being recognized as a peril by the villagers and is encouraging a return to traditional values.